In 2009, Donald X Vaccarino won the prestigious Spiele de Jahre with Dominion, the first popular game to include a deck-building element. Now almost ten years on, Vaccarino returns with the latest game in the line-up: Renaissance, but does it reinvigorate the series? 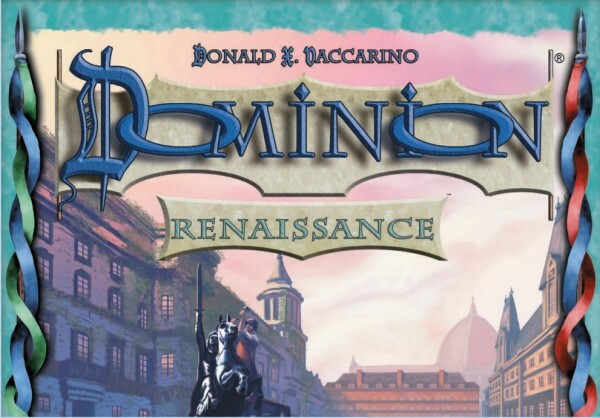 Renaissance marks the twelfth expansion for Dominion, bringing 25 new kingdom cards, 20 Project cards, 5 Artifacts, 6 play mats, 12 wooden cubes and 35 metal coin tokens to the table. The cards themselves are of the usual good standard and the coin tokens are solid, weighty and embossed with intricate engraving. The play mats are large enough to fit their purpose and include useful reminder text for players getting to grips with the rules. All told, the overall quality of the components is excellent. In terms of theme, this expansion is concerned with the Renaissance, a period of European history between the 14th and 17th Centuries which saw widespread cultural, scientific and social progress. This typically expresses itself mechanically through the idea of patronage: many cards require some level of investment and pay off in future turns, akin to a wealthy patron commissioning an artist or scientist. One example of investment can be found in the new Villagers mechanic which allows players to save up actions for future turns. This is an excellent addition to the game; any long-time player of the game knows the frustration of drawing all their best cards in one turn and only being able to use one of them. In a similar vein, the coffers mechanic lets players save money for future turns – a feature first seen in the Guilds expansion. Expect a few explosive turns where a player spends all their villager and coffer tokens to pull off a truly magnificent play. Another type of card making a comeback are Duration cards. First seen in the popular Seaside expansion, these cards offer a lingering effect that applies on the turn on which they are played and the next turn. Unlike the Seaside expansion, which offered the same benefit on each turn, the benefits offered in this expansion are different depending on the specific turn. This marks a welcome evolution of the Duration mechanic, and design space which will hopefully be explored in greater depth in future expansions. Some investments are more subtle, with their effects being triggered due to specific conditions. For example, the Flag Bearer and Silk Merchant cards offers a bonus on acquisition and when they are trashed. Alongside this, a plethora of cards in this set which allow players to trash cards from their deck for substantial benefit. 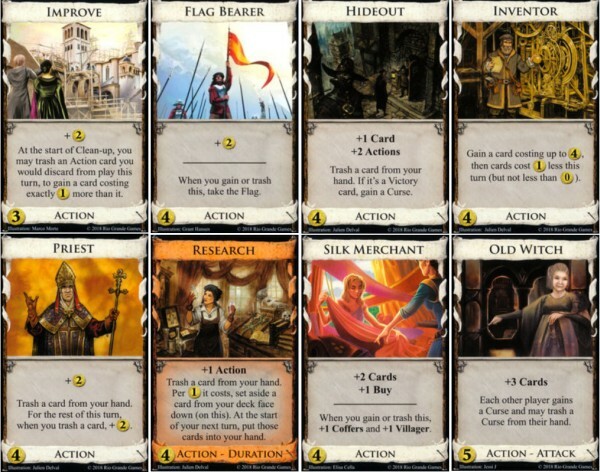 It is clear that a lot of thought has gone into developing the composition of the kingdom cards in this expansion. A few cards even highlight the risks of investment. The Recruiter and Cathedral force you trash cards from your hand. Normally this is an excellent means of refining your deck and improving the overall quality of your draws, but by forcing the trash effect matters can easily backfire and a player could be forced to sacrifice a key piece of their game-winning combo. Artifact cards mark another new addition in this set. These are powerful cards which give ongoing bonuses, such as extra card draws or money. Each card is associated with a specific kingdom deck and can only be acquired by fulfilling specific criteria involving that deck. However, as only one copy of each artifact exists, another player may steal the artifact from you if they subsequently fulfil the relevant criteria. Expect kingdom decks associated with artifacts to drain faster than normal once players start tussling over these powerful toys. The final new element in this expansion is Projects. Projects are similar to Events in the Adventures and Empires sets, insofar as they offer an alternative outlet for excess money. Unlike Events, which trigger each time a player purchases them, Projects can only be bought once but offer an ongoing bonus to any player that has completed them. These effects range from the relatively innocuous to the powerful, but they all subtly change the nature of the game. The cards are reasonably costed and represent interesting options that will spice up any game of Dominion. The rules recommend that players do not play more than a total of two Projects, Events and Landmarks, although experienced players should probably abandon this advice and use two of each type of card for a more involved game with a greater array of tactical options. As ever, the rulebook is straightforward. A great deal of effort has clearly gone into playtesting with an index of cards, clarifications and edge cases. These edge cases apply not only to the base set and Renaissance, but also to all the other Dominion expansions. Such a level of detail in anticipating play issues and rules quirks is to be commended. If a criticism can be made of this set, it lies be with the quality of the artwork. Whilst the graphic design is functional and fits the template of the other games in the series, there is little evidence that the theme has been fully embraced. The Renaissance was renowned for its cultural contribution to Western civilisation. It would have been nice to see artwork more reflective of the time period. With the likes of Da Vinci, Michelangelo, Caravaggio and Botticelli to draw inspiration from, the choice of art direction feels like a missed opportunity. All in all then, Renaissance is one of the better dominion expansions currently available on the market. 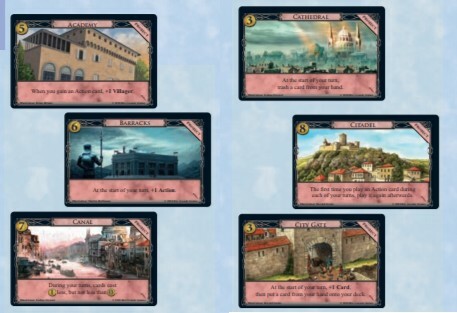 Whereas other expansions have sometimes struggled to express their theme, possessed dull and unmemorable cards or overly complex rules, Renaissance contains a distinct, flavourful set of kingdom cards with interesting mechanics, making it one of the better Dominion expansions – indeed a true Renaissance and return to form for the series.